How to Choose a Good Domain Name for Your Small Business? 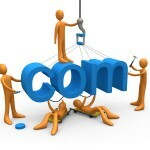 Having a good domain name is one of the most important parts of starting your web presence. A domain name is your own unique identity, so think of one that is easy to remember and relates to your small business. Below are some tips on how to choose a good domain name for your small business. Ideally, you should use your business name as your domain name. For example, if you have a business named SmallBiz Consulting, you first choice should be SmallBizConsulting.com, since people will easily remember it. If this name is not available, choose something similar to your business name. The .com top-level domain name is the most popular extension in the world. If you chose a .net or .org for your business, your customers might forget that your domain name ends with .net; they might just assume that your business has a .com extension. When your clients search your business online, they might just type your domain name with .com – most likely they will be directed to your competitor’s website. If your website or business is only targeting the local community, such as a local restaurant or tutoring center, it makes sense to get a country-specific domain. You actually benefit from having such a local domain because your clients know that they’re dealing with a local business, which will make them more comfortable. Obviously, it is easy to remember and easy to type. The rule of thumb is no more than 20 letters. For example, our domain name TopLevelWebDesign.com, we use the key word, web design, as the most important part of our domain name. We know that when people are looking for a web design company online, they will type phases like “web design company in New York”, etc. There is Search Engine Optimization (SEO) advantage for using key words in your domain name. You want people to talk about your business? You want to promote your business through word of mouth? Keep your domain name easy to spell and pronounce. For branding purposes, keep it descriptive as well. To avoid confusion and keep the similar domains away from your competitors, it’s highly recommended to purchase both the singular and plural version of your domain name if applicable. For example, you can register both HappyTutors.com and HappyTutor.com. Set up your business website on HappyTutors.com and then redirect HappyTutor.com to HappyTutors.com. Therefore, if people happen to search HappyTutor.com, they will still be directed to your website. Last but not least, Act fast! Once you find a good domain name available, register it immediately before someone else grabs it. Why should you have a Mobile-friendly Website? Why do You Need a Website for Your Small Business? Welcome to Top Level Web Design!